One of the first things I do with a new client is have them complete a 3-day food log. When I ask someone about their diet, the most common answer is, “I eat pretty healthy most of the time,” so this is a reliable way for me to learn exactly what they mean by this. Even if you’re not working with a coach, completing a short-term food log or audit is a great way to determine how to best set yourself up for weight loss success. This article will explain exactly what a food audit is, how to do one, and why they’re so important. Our memories are notoriously unreliable and as a result, when it comes to food intake, we tend to grossly underestimate what we’re eating. I was in line at Dunkin’ Donuts the other day and the woman in front of me ordered a coffee with 8 creamers. According to their website, 1 creamer has 40 calories, so this woman’s coffee contained 320 calories from creamers alone. I would be willing to bet that if she were to replay her day of eating, she’d just note “coffee,” rather than accounting for all the add-ins, as well. Writing down every detail of her food throughout the day – as she ate or drank it, would give her a much more accurate picture of her actual intake and help her realize that just switching to black coffee could save her 300+ calories per day! When asked to review our food choices at the end of the day or the following day, it’s very likely that we’ll omit entire meals, snacks, or drinks – not because we’re intentionally lying to ourselves but because our memories just aren’t that great. In addition to having unreliable memories, we also tend to be pretty bad at estimating portions – especially without a lot of practice. The result is that what we think is a small handful of nuts might actually be 2-3 servings worth and account for a difference of up to 500 calories! Most of us are not accustomed to even looking at the serving sizes listed on nutrition panels, let alone attempting to eat according to them. If you have any cereal in your house, pour yourself a normal-sized bowl and then check out what the label considers one serving. Get out your measuring spoon and see how many servings you actually gave yourself. I’m willing to bet that it’s well more than one. When we tell ourselves that we’re only eating a handful of nuts and a bowl of cereal for snacks, it can be hard to see why we’re not losing weight. But when we hone in on how much of them we’re actually eating, we can find that we were underestimating by hundreds of calories per day! 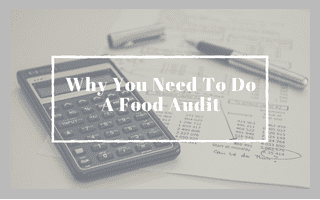 Much less stressful than being audited by the IRS, during a food audit, you simply keep a running log of exactly what – and how much – you eat for a few days. It’s most accurate to add to your log as you go, for reasons mentioned above. It can be tedious and, at points, challenging, especially if you’re eating at restaurants but with a little bit of diligence, you can put together a pretty accurate view of your intake. This isn’t something you have to (or should) do forever, so put in the effort to get the most out of it when you do it. How you choose to log your intake is totally up to you. Some people prefer a photo log, wherein they snap photos of every meal, snack, and drink. This works well for visual learners and can be used in conjunction with one of the other methods since it’ll help trigger your memory. Another method is pen & paper or a small notebook that you keep with you all day and jot down intake as you go. This method is preferable for those who aren’t very tech savvy and aren’t open to learning a new app. Lastly, you can log all your food and drinks into an app such as MyFitnessPal. This option has the steepest learning curve but is great for people who love data. Any of these approaches will work and the more effort you’re willing to put in to your preferred method, the better intel you’ll be able to gather as a result. Regardless of if you’re snapping a pic, jotting a note, or logging an entry, if it goes in your mouth, it gets counted. That means any bites, nibbles, and sips that might occur outside of meal time, too. Keep your log for at least 3 days, ideally including at least one weekend day, before sitting down to take a look at what you can learn. Ready to take action? Take the 5-day, video-guided Food Audit Challenge: Learn How to Change Your Diet to Lose Weight – Even if You Already “Eat Healthy”. You’ll likely find that you make healthier decisions just because you know you have to account for everything you ingest. Even if no one is seeing the log besides you, just having that accountability can help you say no to breakroom snacks or second helpings of dinner. You’ll learn valuable information about your accuracy at estimating portions. Most likely, you’ll find that you’ve been eating multiple servings of things like fats and carbs (and especially fat/carb combos) and thinking it was only one. Once you have a few days of weighing or measuring portions under your belt, you’ll be better able to estimate them going forward. You’ll find areas of opportunity to save calories without drastically overhauling your diet. Many women think they’re eating a 1,200 calorie diet but come to find out they’re really closer to 2,000 (or more!) Once that comes to light, it becomes a lot easier to create a calorie deficit without making major sacrifices. Just limiting yourself to single servings of snack foods or swapping veggies and hummus for chips and queso could make all the difference between beginning to lose weight and staying stuck where you are. Completing the audit is only half the battle; you actually need to implement changes if you want to see results. This means making a plan of action and sticking to it. -Are overestimating portions on the regular, continue to measure them out until you’re more accurate, learn how much space those foods take up on your dishware, or pre-portion out snacky items as soon as you get home. –Undereat a certain important food group, such as protein or vegetables, set goals for yourself to eat them at a certain number of meals per week and make those foods a priority. -Biggest opportunities are habits that will be hard to break, pick one thing at a time to improve or eliminate (for example, cutting down to 1 creamer in your coffee) and allow yourself some time to adjust to this change. Once it feels like the new norm, move onto the next challenge. Over time, you’ll have totally revamped your diet without being totally miserable in the process. Ready to do this thing?! Join me for a 5-day, video-guided Food Audit Challenge: Learn How to Change Your Diet to Lose Weight – Even if You Already “Eat Healthy”. By the end of the challenge, you’ll have identified your top dietary priorities and you’ll know exactly how to go about improving them so that you start losing weight!